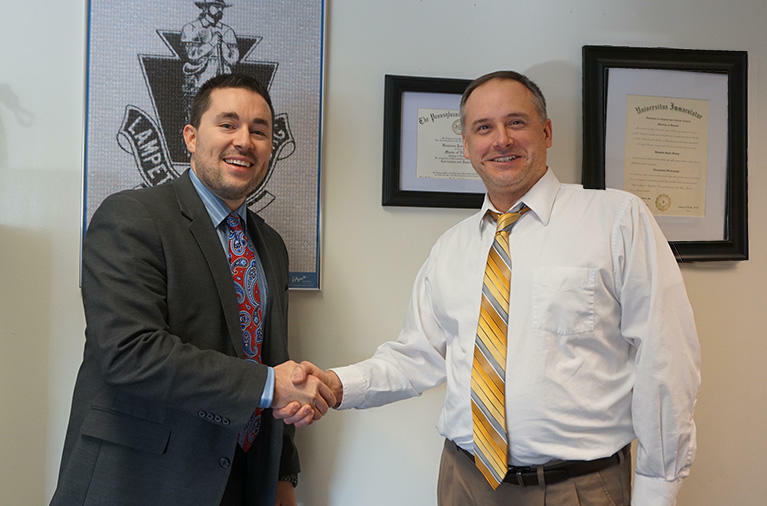 On Tuesday, Dr. Benjamin Feeney Principal of Lampeter-Strasburg high school announced that science teacher Mr. Bronston Sterner had been selected as the January 2017 Teacher of the Month. Dr. Feeney congratulating Sterner on his selection as Teacher of the Month. Sterner selection was due in large part to the dual nominations he received from faculty members as well as a nomination from a student. The student who nominated Sterner said, "[He] takes time out of his mornings to do review sessions for his students, and makes sure that his students understand the material before taking the tests and quizzes." Colleagues also had this to say about Sterner. Bronston took on the role of teaching Environmental Science this year which was above and beyond the call of duty! This morning he had signs to help his Anatomy and Physiology kids review for their test today! "Bronston has provided constructive advice whether I was working with a student teacher in the PDS model a few years ago or when I began implementing a new instructional method called "hybrid". Whenever I was looking for solid and helpful advice, Bronston would take time to show me how different web based learning activities can be incorporated into the classroom." Sterner will be recognized at an upcoming School Board meeting as well as enjoy holding the title of first ever high school Teacher of the Month.